East Nashville Underground’s 3rd Annual Pumpkin Patch ft. Scale Model, Twiggs, & American Dream | Saturday Oct. 24! Are you tired of the kids enjoying all the fun, festive fall outdoor activities? Well, how does about a pumpkin patch for grown-ups sound? 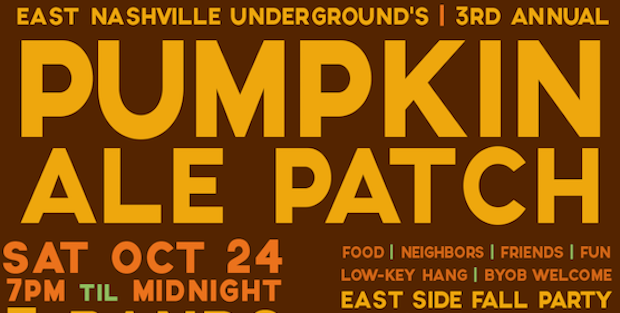 Our friends over at East Nashville Underground are hosting their 3rd annual Pumpkin Ale Patch on the east side on Saturday, Oct. 24. The event features food vendors, beverages, chill autumn hangs, and friendship; but, it also features three of our favorite east side bands, Scale Model, Twiggs, and American Dream. That not enough for you? When the music dies down, snuggle up and watch the seminal autumn horror movie, the original Halloween, on the big screen! You get all of this for just $5 at the door. Feel to bring your own chair, blanket, and BYOB if pumpkin-y libations aren’t your fancy. The music gets started at 8pm and continues until 10pm when the movie screening gets started. Get in the spirit of fall, and enjoy the outdoor evenings while you still can. More details (including the event address) are available at eastnashvilleunderground.com, the event Facebook page, or on the event poster below. 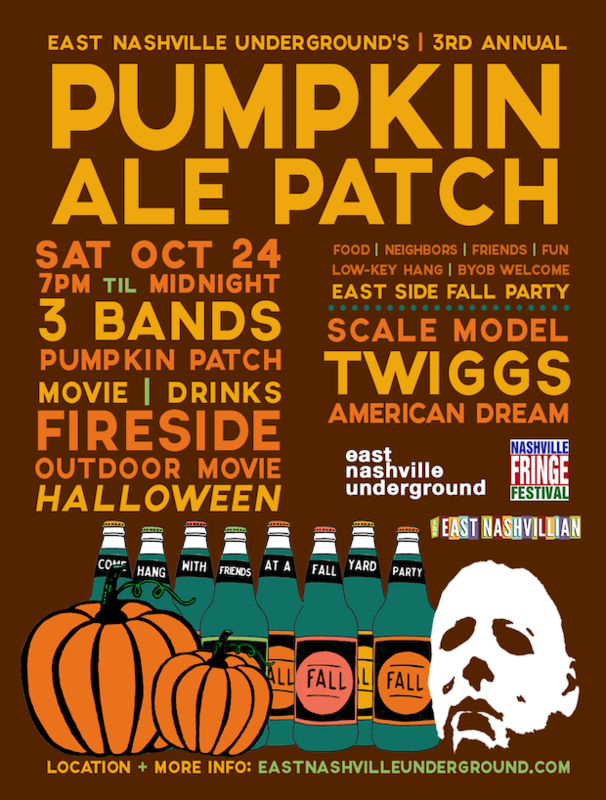 East Nashville Underground’s 3rd Annual Pumpkin Ale Patch takes place Saturday Oct. 24 and features performance by Scale Model, Twiggs, and American Dream. Following the music will be a screening of the original Halloween. The event is 21+, begins at 8pm (gates at 7pm), and tickets are available for $5 at the door.